Limnobium spongia (South American spongeplant) is a perennial aquatic plant (family Hydrocharitaceae) found on the San Joaquin river and the Sacramento-San Joaquin delta. The spongeplant can form thick mats across the water causing problems for boats, fish, and water infrastructure. Limbnobium spongia can spread rapidly through quick seed production and vegetative growth. 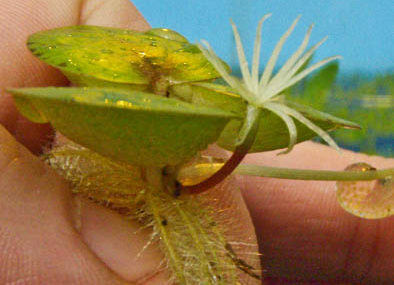 The small, floating seeds easily disperse once produced.